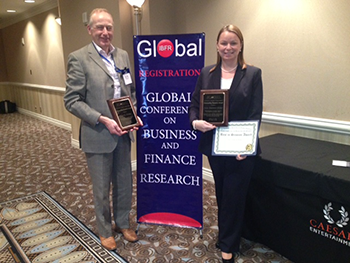 Two lecturers in the Business School at Middlesex University have secured Outstanding Research Awards at the Global Conference on Business and Finance in the US. Senior Lecturer and Teaching Fellow Dr Julie Haddock-Millar and Senior Human Resource Management Lecturer Chris Rigby submitted and presented two peer-reviewed papers for which they were both commended. The paper 'Business and finance case study: business strategy and the environment; Tesco PLC's declining financial performance and underlying issues' was also named 'Best in Session'. As a result of this success, Julie and Chris have been invited to submit both papers to the journals Business Education and Accreditation and Review of Business and Finance Case Studies. "We are delighted with the recognition the team and University have received," the pair said. "The first paper was the result of an endowment awarded by Director for Corporate Engagement David Williams and his team, while the second paper was supported by the University's Teaching Fellow Committee." The Business School enjoyed great success in the recent Research Excellence Framework 2014, with 92 per cent of its research adjudged to have 'very considerable' or 'outstanding' impact.